We’ve been told there’s a lot more late-season snow than we were expecting…. What with the UK experiencing the hitherto unknown phenomenon of “Summer” during the months of May and June 2018 it was slight shock to find that Asturias was a little more temperate. However, stepping off the plane and into Paolo’s van (the Club Joker) it seemed an ideal temperature for long mountain walks. 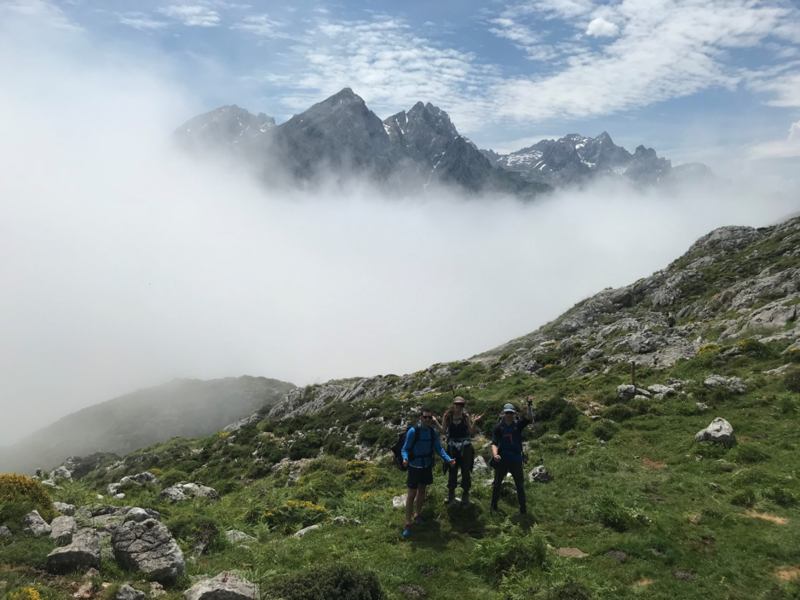 Between them Paolo and Jasmin had sorted out our lifts up to the Hostal Poncebos (our entry point for the Picos mountains) and Ander, Chris, Jules and Nick just kicked back and enjoyed the scenery. 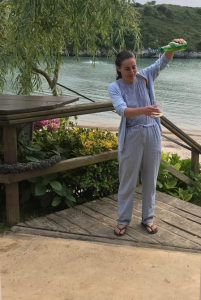 Before we knew it we were at the comfortable riverside hostal enjoying the first of many excellent Asturian meals (typically about €10 for three courses and wine!). The plan for the first day was to walk half of the famous Ruta del Cares trail through the deep gorge that separates the western and central massifs before heading west steeply up to the Ario hut. The first part of the day was therefore a gentle introduction to the dramatic scenery of the Picos. The majority of our fellow walkers were day trippers and they looked surprised to see us with our large rucksacks and walking poles or in Paolo’s case (and in only in Paolo’s case) an ice axe. Our other companions in the morning were the local goats. Ander, who comes from neighbouring province Navarre, was fluent in their lingo and, having offered one an almond, soon found many more seeking his attention. We then started climbing steeply out of the gorge: up through the tree-line and then onto scree slopes. At this point the mist descended (or was it us ascending into the mist?) and it became rather eerie and still. However, continuing the climb there was suddenly a break in the clouds and we had a beautiful moment of mountain panorama. Towards the top of the ascent we encountered a section of icy-snow. 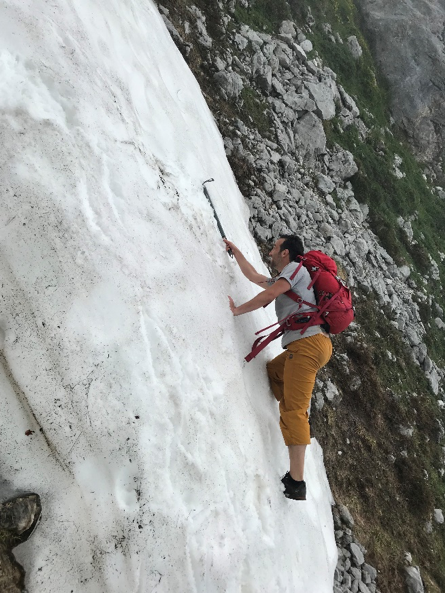 Although there was a way around it Paolo saw it as a perfect opportunity to get some practice in with the new ice-axe. Nick also had a try but with less success. Soon after this japery the dark clouds that had been threatening over the last hour finally broke and we found ourselves in a thunderstorm that alternated between rain and hail. With the evening coming on and the hut almost in sight Nick thought it would be best (for the whole group of course) if he ran on ahead so as to get out of the rain more quickly (oh and also make sure the hut knew we were arriving for dinner). Eventually the whole group was accounted for and we settled down to a fine evening of beer and hearty food. That night there was a magnificent moon-rise over the distant mountains – in fact, in exactly the direction we were headed the next day. HOSTAL VALDEONThe following day’s route would take us back into the gorge to complete the Ruta del Cares and then onto Posada de Valdeon. The first part of the walk took us off the marked trails such that compass navigation would be required. As it turned out, however, there was a local guide staying at the hut who was going the same way with a group of Germans. We enquired as to his departure time and by coincidence we were planning to leave at the same time! An hour into the walk Paolo realised that he’d left a jumper at the hut. Ever game for more exercise Nick played the “have-a-go-hero” role and ran back to get it. The only problem was, having followed the guide, Nick hadn’t paid much attention to the route taken and, after going up and down three small valleys without once spotting the hut, he decided (with the mist again building) that this had “Unprepared Tourist Gets Lost in National Park” written all over it. He therefore sprinted back to Paolo to find that the main group was now lost in the mist below a section of scrambling. The main group’s passage through this had not been without incident as Jules had lost her footing and taken quite a fall on the rocks (saved from further injury by Chris’s steadying hand). 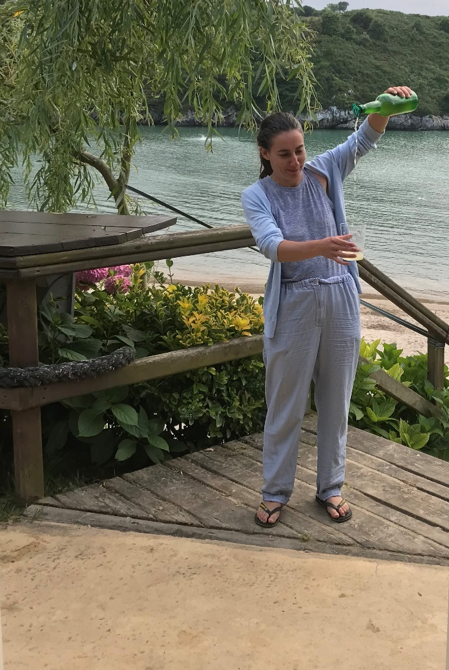 For the rest of the trip she proudly showed off the blossoming bruise that had formed on the lower part of her leg. After the scrambling we were really were back in the thick of it, mist-wise, and for a while we thought we’d lost Chris (Joe would never have forgiven us!). Having recovered him we decided a spot of lunch was in order and the weather blessed us with another clearing. 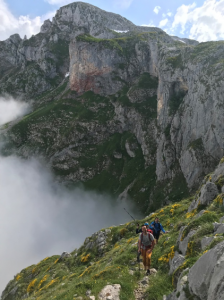 A final steep descent brought us back to the comparative relaxation of the gorge and we completed the famous route in its entirety. 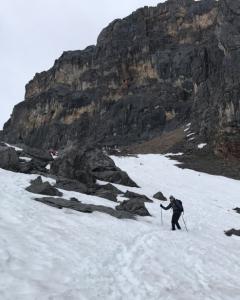 The next day was to involve a steep ascent on some precarious trails; we also expected to encounter our first non-optional snow crossings. 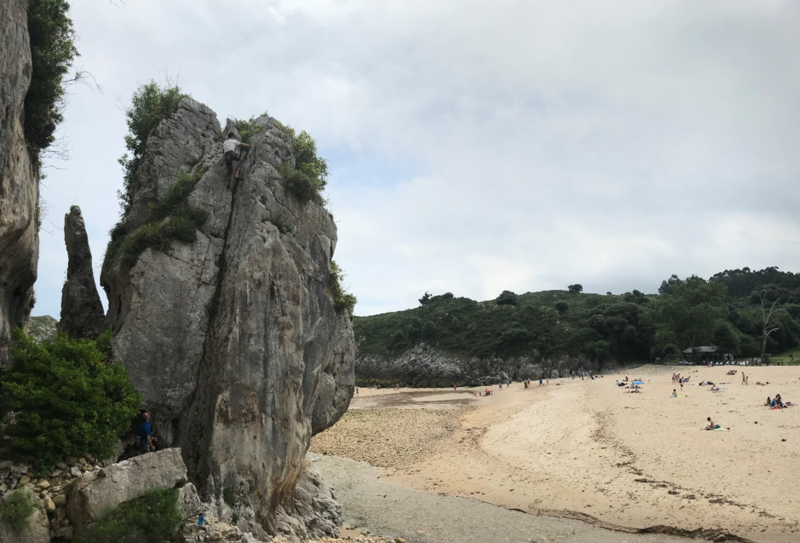 After her (mis)adventures on the rock the day before, Jules decided to take the low road – while we took the high road – and to see who made it to Scotland (or more accurately Fuente Dé) first. To add a little more spice there was a large thunderstorm forecast for the afternoon so we of course planned the classic MMC alpine start (0900 for 0930 depending on how much breakfast we fancied). 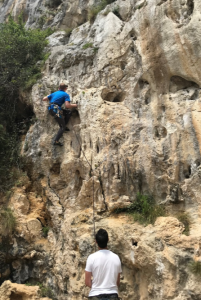 The high road started with a wonderfully narrow path that clung to the side of the cliff above the hamlet of Cordiñanes. Turning east we enjoyed the cooling shade and dappled light of a mountain glade before finding a perfect lunch spot above the tree-line. Afterwards two switchbacks took us abruptly up to around 1700m and our first section of snow. 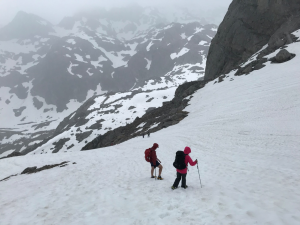 The storm continued well into the next morning but we eventually got a break in the weather and started our descent from the hut (2100m) to the village of Fuente De (1700m). This involved further snow crossings, including a precarious tip-toe along a section that dropped steeply to oblivion on the right-hand side. Dropping down into a green valley we then had a good sighting of the local Chamois goat (known as a Rebeco) before a mightily steep descent into the village. 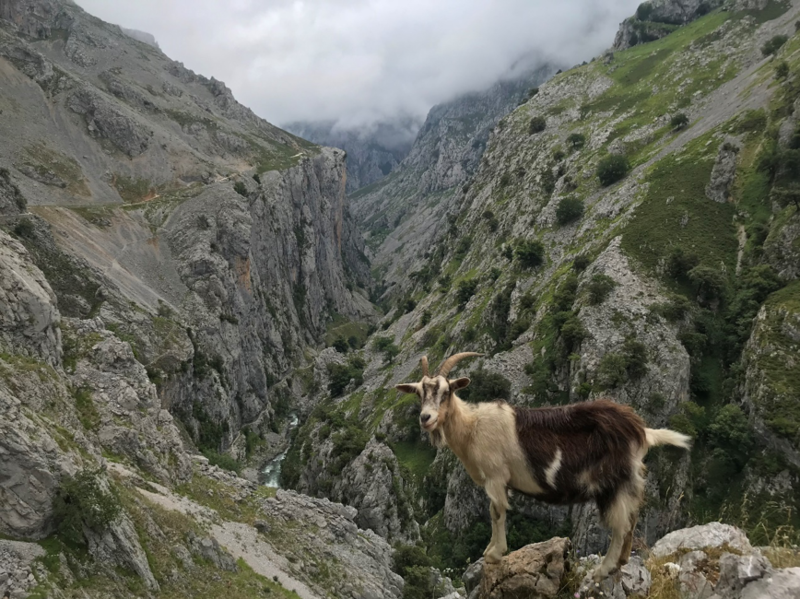 There we checked into the Hotel Rebeco, for a little mid-trail luxury, and had further sightings of the famous goat (though this time only of its head). 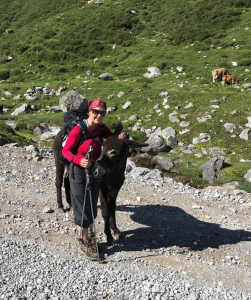 We were also happily reunited with Jules who regaled us with stories of her odyssey across the foothills, which involved a particularly entertaining description of a running battle with a fearsome farm dog. The snow crossings start heating up! We awoke to bright sunshine and a sense of adventure. 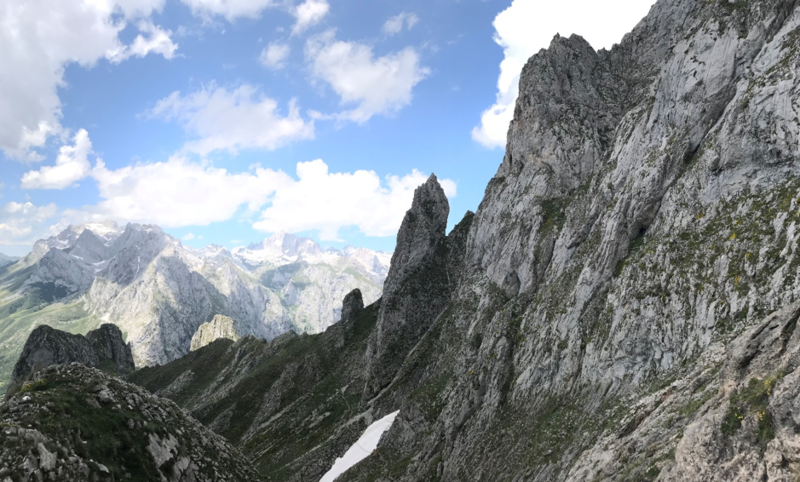 Today was to involve the highest section of the walk and we intended to stay at the Urriellu hut, right next to the famous mountain. 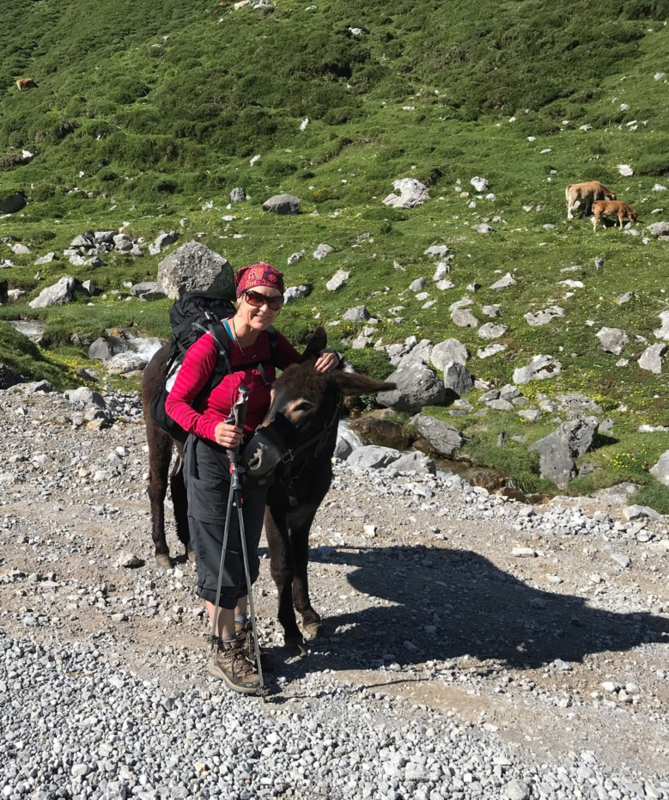 To get us quickly back up into the high mountains we first took the cable car and then followed some very well-marked paths past beautiful blue tarns. These gave way to a hardly noticeable gravel trail which led onto a long section of snow. 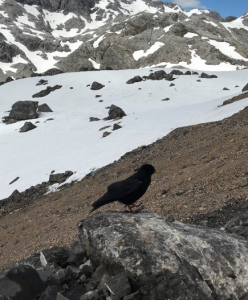 We stopped for lunch and found we had an extra guest: an alpine chough who, echoing his name, looked very pleased with every morsel that was thrown his way. Moving on the snow became continuous and, coming to the bottom of a section reminiscent of a red ski run, we all put on various types of walking spikes to ease the ascent. After this we took a trail following the contour of the mountain and caught up with two hikers from Preston, Lancashire who had stopped to give further thought to the next section. 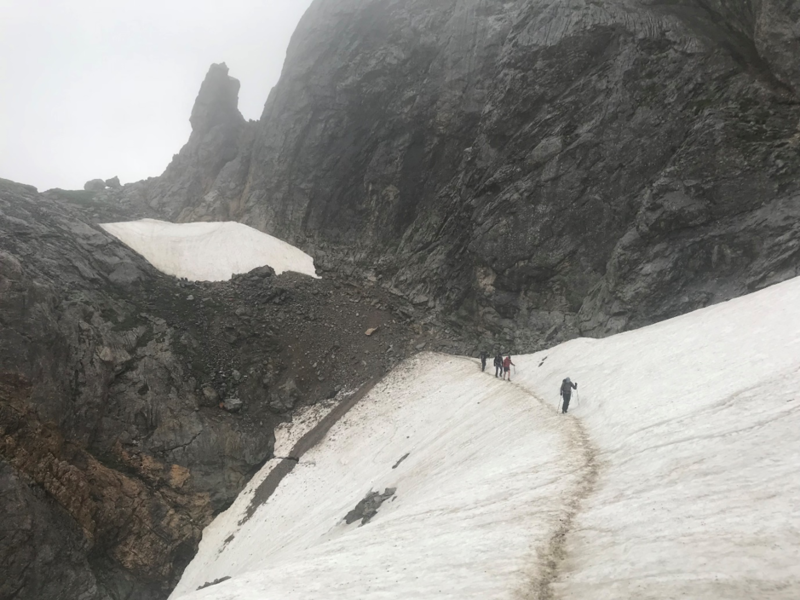 “We’ve not got crampons or axes” he began, “And when I was half way across this next section the wife said ‘Think what would happen if you fell there’”. Ander, Chris and Nick stared warily at the suddenly more slippery looking slope ahead with its huge drop down into the valley. The man continued: “I mean if you fell from there you wouldn’t believe the speed you’d pick up. I’ve seen it happen. A walking pole wouldn’t stop you at all. 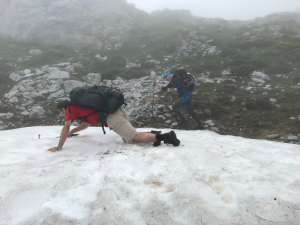 I don’t want to put you off…but if you slipped you’d be cartwheeling before you knew it.” Paolo now approached the growing group: “Is someone up there telling us we’re all doomed?” he enquired. The man (and the wife) from Preston had now started descending and he explained again: “See, I don’t want to put you off, but even a little fall could send you right over the edge”. A little team debate followed: although some thought it would be possible to continue, the risks of encountering more challenging terrain (and the horrible thought of possibly having to re-cross the upcoming section in descent) suggested a graceful retreat. The debate was concluded by a huge crack of thunder which sent us scurrying back down the mountain. The change of plan meant a change of accommodation was needed: Paolo and Jasmin smoothly arranged this and we were soon at the Refugio (more of a hotel) Aliva. Restorative showers and more fine Asturian food completed an exciting day! The next day Paolo and Ander were up early so Ander could get back to Oviedo in time for his return flight. The rest of the team enjoyed a leisurely walk down a broad and sunny valley back to the Hostal Poncebos. This marked the end of the walk and a chance to get some R&R (Rock climbing and Resting) by the beach. We all jumped in the Club Joker and hit the coast, ending up at the surprisingly named Playa del Poo. This proved to be far more pleasant than its name would suggest and marked the perfect end to a fantastic trip. What more could you want after a 6-day walk? Huge thanks to Paolo and Jasmin and family for organising and running an awesome summer trip – we look forward to returning to the Picos again soon.